Ronda Rousey will wrestle on next week's episode of Raw, Jerry Lawler briefly comments on the investigation into his son's death, Nikki Bella issues a statement on breakup with John Cena, Conor McGregor says a deal for his fight is "close", WWE extends partnership with their Australian television partner & lots more. Today’s edition of Rewind-A-Raw is up on the site as Wai Ting & I review Monday’s show from Miami with the return of Brock Lesnar and a show-long angle culminating in an attack on Kurt Angle and apparent split between Lesnar and Paul Heyman. They have also announced Ronda Rousey will have her first match on Raw next week, there was a terrible segment with Elias & Bobby Lashley, and Wai’s nephew reviews the match between Baron Corbin and Finn Balor. You can download Rewind-A-Raw from the site or subscribe to POST Wrestling’s podcast feed with any of your podcast apps. Also out today, is the DOUBLE SHOT for members of the POST Wrestling Café. On this week’s show, Wai reviews the season finale of Total Bellas, I chat about last Thursday’s episode of Impact coming off Slammiversary, and we also chat this week’s Being the Elite show with the announcement of a big six-man tag for the ‘All In’ show in September. The show is available for all members of the Café. Signing up for $6 a month will get you this show, every one of our G1 reviews and the entire archive of shows. Wai Ting and I are back tonight with Rewind-A-SmackDown to chat tonight’s show from Tampa, all the latest news and we will take your feedback and questions. The G1 Climax podcasts continue with new shows out Wednesday and Thursday on the POST Wrestling Café. This Friday on Rewind-A-Wai, Wai Ting and I will review the Being the Elite series with the evolution of the show over the past two years, highlights of the series, its influence and why the show has helped enhance so many performers. This was chosen by Mitch Gelkopf, our Espresso Executive Producer this week and we are taking feedback for this show on the POST Wrestling Forum. **Jerry Lawler spoke to reporter Zach Crenshaw of Fox 13 in Memphis following the passing of his son, Brian. Lawler rushed back home on Sunday morning from Raleigh, North Carolina when he heard the news about his son and was at the hospital with family members and friends prior to Brian being pronounced dead. The Tennessee Bureau of Investigation is looking into Brian’s death with Lawler telling the reporter, “there may be more to this than meets the eye”, but Lawler has been instructed not to speak about the investigation until it is completed. The visitation and funeral for Brian Lawler are scheduled for this Friday in Tennessee. **Ronda Rousey will have her first match on Raw next Monday in Jacksonville, Florida against Alicia Fox. The announcement was made on Monday’s episode with Fox being inserted as a replacement for Mickie James, who we are told is injured. 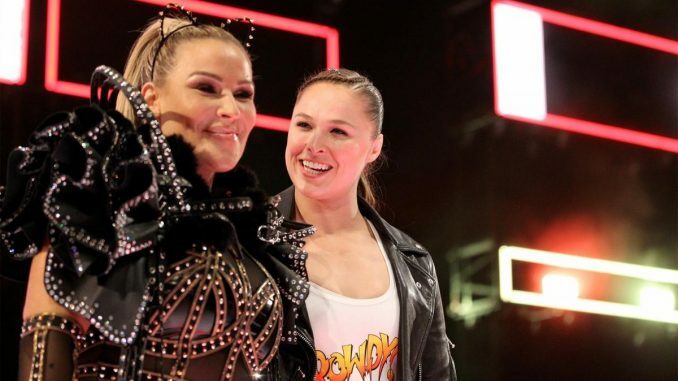 The options for Rousey’s opponent were limited on the heel side with Alexa Bliss being saved for SummerSlam, Mickie James and Ruby Riott injured and leaving them with the options of Fox, Liv Morgan, and Sarah Logan. The match should be carefully laid out and could be promoted as the main event of next week’s show unless there is a concern of them going long and can be booked to be a quick match with an armbar submission. Regardless, I would expect a heightened viewership next week with the draw of Rousey’s first free match on television as the hook. They could also benefit from the media tour Rousey is on for “Mile 22” and mention the match in her appearances. **The second episode of Miz & Mrs airs immediately after SmackDown tonight at 10 pm Eastern on the USA Network. The show got off to a strong start with 1,473,000 viewers for the premiere episode so that’s the benchmark heading into the second week. Dolph Ziggler will be appearing on tonight’s show. **The G1 continues on Thursday with a show in Fukuoka and the following A Block matches: Michael Elgin vs. Bad Luck Fale, Hangman Page vs. Togi Makabe, Jay White vs. Yoshi-Hashi, Hiroshi Tanahashi vs. EVIL, and Kazuchika Okada vs. Minoru Suzuki. **The WWE announced a new agreement with their Australian television partner, Foxtel that will see Raw and SmackDown continue to air live in the country but will also feature repeat airings in prime time. Raw will continue to air live Tuesdays at 10 am and SmackDown on Wednesday at 10 am on Foxtel’s FOX8. The new deal will feature Raw and SmackDown having a repeat on Tuesday and Wednesday nights respectively in prime time. In addition, FOX Sports will air one-hour versions of each show in prime time during the week with replays of the show available on demand after they air on Foxtel Now. **Tickets go on sale Wednesday for New Japan Pro Wrestling’s return to the United States with their “Fighting Spirit Unleashed” card at the Walter Pyramid in Long Beach, California on Sunday, September 30th. They are scaling back after running the Cow Palace earlier this month and returning to the 4,700-seat venue they sold out in March. The last time they ran the Walter Pyramid, there was a concern they were returning too quickly and running too close to WrestleMania Week in New Orleans and sold it out instantly. I feel they will sell this show out as well, it’s just a question of how fast tickets move with a first-day sell out very possible. The factors running against them is that “All In” is taking place a month before, they have nothing announced for this card, and fans are likely budgeting their dollars with tickets going on sale in less than two weeks for the combined Ring of Honor & NJPW show at Madison Square Garden next April. New Japan is still considered a hot ticket in the U.S. and given the reduction in building size, it should sell out. After I called off the engagement, we tried to work on our relationship to get back to where it was, and in order to move forward with our wedding. After much time and soul-searching alone and together, we have decided to officially part ways. I had a beautiful and loving 6-year relationship with a wonderful man. I have the utmost respect for John, but I know this is what’s best for me. **Impact Wrestling has announced that they have signed Rich Swann to a long-term contract, although the exact length was not disclosed. Swann was released by the WWE earlier this year after he was facing charges of domestic battery and false imprisonment over an alleged incident with his wife, Vannarah Riggs, in public last December. The case did not move forward due to a lack of evidence, but he was still released by the WWE. Swann was discussing retirement earlier this year, although he was present in New Orleans over WrestleMania weekend but didn’t wrestle. His first match after leaving the WWE was with CZW this past April and began working for Impact at the June tapings in Windsor, Ontario and has begun working with MLW as well. Swann is believed to have suffered a concussion two weeks ago at the MLW show in Queens, New York and was forced to withdraw from his scheduled four-way match at Slammiversary, although was in Toronto last week. **Jado has been out of action since July 20th due to a left foot injury and New Japan has announced he will miss the rest of the G1 tour. Jado had been working on the undercards of the G1 shows in tag matches. Jado last wrestled on July 20th at Korakuen Hall in a tag match with Yoshi-Hashi against Tetsuya Naito and Bushi. **UFC interim welterweight champion Colby Covington and former welterweight champion Matt Hughes attended Raw on Monday in Miami. Covington was decked out in a suit with his championship belt and a “Make American Great Again” hat while taking photos with wrestlers, including Ronda Rousey and Jinder Mahal. **The season finale of Total Bellas averaged 617,000 viewers on Sunday night for E! The ten-episode season averaged 634,200 viewers for the third season of the reality series. The third season was up 8% in viewership from the second season that aired in the fall of 2017 and was an eight-episode season. **Lince Dorado is dealing with an injured thumb. **Roddy Piper (Roderick Toombs) passed away on this date in 2015 at the age of 61. Piper died on a Friday and the next day after her win over Bethe Correia at UFC 190, Ronda Rousey dedicated her victory to Piper when she was interviewed by Joe Rogan after the fight. At the time of his passing, Piper was working on a second autobiography and the book was completed by his children, Ariel and Colt. I recommend the book as his children did a great job researching their father, understanding that the line was blurred between fact and fiction and made an honest to dispel the fantasy from their father’s life and it was a well-done book on Piper’s life. **In an update on Leslie Smith, the former UFC fighter recently spoke to Sports Business Journal about the plight of sign-ups for Project Spearhead in her efforts to have fighters be eligible for unionization. Smith tells SBJ that since her contract was not renewed by the UFC that, “everything has slowed down”. For the National Labor Relations Board to look at UFC fighters’ eligibility they need 200 signatures from the current roster of fighters and Project Spearhead has not reached that target. The NLRB does not deal with independent contractors, so the distinction is important for their status to be acknowledged by the signatures. Smith had won her last two fights with the UFC and was scheduled to fight Aspen Ladd in April, but Ladd missed weight and Smith was not willing to fight her at a catchweight with minimal incentive provided. Smith was paid her show and win money by the UFC, but also informed her contract wasn’t going to be renewed and was effectively let go. **Conor McGregor spoke to Adam Glyn on the streets of New York with the video appearing on TMZ. McGregor stated they were “close” to finalizing his next fight, although he didn’t confirm it would be with Khabib Nurmagomedov. McGregor added that he would like to fight in New York, but this next fight looks to be taking place in Las Vegas. That will set up possible dates of October 6th (which has been discussed a lot) and December 29th with those cards taking place at the T-Mobile Arena in Las Vegas. McGregor added that he was very happy for Jose Aldo after his win this past Saturday over Jeremy Stephens, which was Aldo’s first victory since July 2016. Martin Bushby, Oli Court & Benno present a special edition of the show, reviewing the premiere episode of World of Sport on ITV, what worked and what didn’t work, as their ten-week run on ITV kicks off. Chris Charlton welcomes wrestling historian Pat Laprade, as well as Dann & Emily Read of Pro Wrestling EVE to discuss the Tokyo Dome events of 1994, including the Big Egg Universe card from November ’94.